TruTech What kind of door person are you? What kind of door person are you? Kind of a silly question to ask but in today’s world, why not? The cookie cutter look, once the norm in residential properties is giving way to self-expression and individual style. What better way to express yourself than through your front entrance? There appears to be a growing trend towards wider, taller entrance doors, painted starkly rich and sometimes provocative colors. Less glass in door panels seems to be the in thing today. Gone tomorrow? Glass patterns, once very ornate and almost floral seem to be trending to linear, geometric patterns. European styling and contemporary designs have infiltrated the market making bold statements. The home owner’s personal taste and style can now be fully realized. Changing your front entryway used to be simple, 6 panel design, ½, ¾ or full lite glass option, done! Now there are a wide array of panel designs and styles! Fiberglass doors that beg for stain and achieve a real wood look that even under close inspection represent that true wood look and feel! 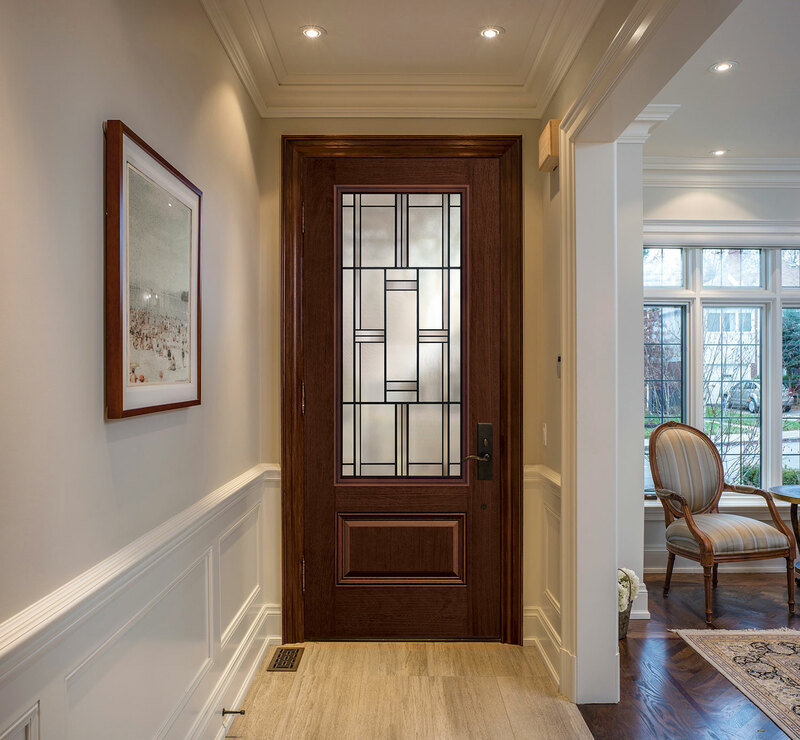 Tru Tech introduced the Arteferro wrought iron possibility into glass door designs a few years ago, and it appeared destined for a niche category product. Now several competitors have introduced similar or lower cost alternatives in order to satisfy consumer demand. Sometimes it just takes time. When choosing the correct door for your home, ask yourself “what type of door person am I?” If you choose Tru Tech you will be ensured not only a quality product from a reputable dealer but the greatest opportunity to find a door that is distinctively you. At Tru Tech we believe in giving you the ability to define your style and express your creativity. Through our extensive dealer network, we help thousands of homeowners find their unique entrance. If you choose Tru Tech, you can be assured, we can provide just the right entrance for you, your family and your home.